1. Think carefully about your guest list. It’s easy to get carried away when you’re writing out your guest list, and you can quickly end up with a list as long as your arm. You want your loved ones there to celebrate your big day, of course. But if there are people on your list that you aren’t in touch with normally or haven’t seen for years, it’s worth thinking carefully. Your event may become harder to manage and less intimate, whilst also clocking up the costs for you. 3. plan ahead so you’re not caught out! You don’t want to discover that you’ve forgotten an essential item a week before the wedding, causing you to splash out and go over your budget. Start planning well in advance and pay close attention to every detail. This will give you time to shop around, compare prices and hold out for sales or discounts, whilst making the whole experience stress-free and enjoyable. Bridebook is a free app which can help you keep track of everything from venues to budgets and guest lists. If you’re crafty, or willing to try, you can hand-make everything from invitations to table placements and centrepieces, decorations and flower bouquets. Even if you haven’t got much experience with a certain craft you can learn a lot from online videos and tutorials – but have a practice run or two first! There are some fantastic ideas over at You and Your Wedding to give you some inspiration. 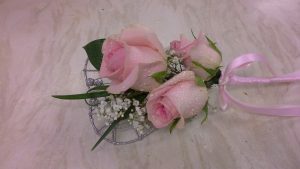 Adopt a less is more approach when it comes to flowers – a single rose can look as stunning, and even more stylish, than a full bouquet in your bridesmaid’s hands. Or raid your own garden for some blooms – just make sure you know that the flower you want will be flowering at the right time! 6. Hire a photographer just for the ceremony – and hand out disposable cameras to your guests. You definitely want to capture those beautiful shots of your big day, but hiring a professional photographer comes with a hefty price tag. Consider hiring a photographer just for the ceremony rather than the full day. Hand out disposable cameras to your guests and ask them to help contribute to capturing the atmosphere and the unforgettable moments, from cutting the cake to some late-night hilarious dance moves! Have some collection baskets to gather up the cameras at the end of the night. With local Facebook groups, it’s never been easier to find preloved, great quality items. This particularly applies to wedding items that are treated gently and only used once, like decorations – candles, table centrepieces, vases – and even wedding dresses. You can come across some real gems this way at a fraction of the retail price, saving yourself a lot of money, and it’s more eco-friendly too. Check out Sell My Wedding, a marketplace for preloved wedding items across several categories, to get you started. No one other than you will have any idea that the item isn’t brand new! 8. Create a DIY sweetie table that is Pinterest worthy. 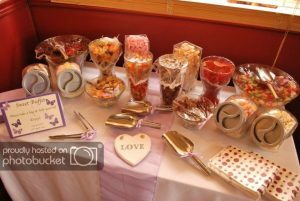 Having a Sweetie Table is a great feature that goes down like a storm with everyone from the little kids to the grown-ups, and it’s something you can easily pull together yourself. Ditch the plastic containers they came in and use some pretty vintage vases or plates to display your goodies to their best advantage. You can pick up some great finds at local charity shops or car boot sales, or ask around to see if anyone has some you could borrow. Keep your colour scheme in mind though when it comes both to the sweets and to your decor for a really stylish look. Fairy lights and bunting both create a sweet, magical look. If you’ve got some excellent chefs in the family, see if you can team up in the days leading up the wedding, roll up your sleeves, switch on a playlist and get cooking. You can save a lot of money this way on catering, and it can be good fun too – especially if you can share out the tasks amongst a few people. However, if this sounds like your idea of a nightmare, negotiate with a local, family-run restaurant to see if they can cater for your wedding. This is normally much more affordable than hiring a catering service or a big chain restaurant. 10. Opt for a mini-moon instead of an extravagant honeymoon. There will be plenty of time for expensive, overseas holidays in the future. But when you’re already planning a wedding on a budget, throwing in a luxurious foreign holiday is only going to add to your stress levels. After the busy (dare we say chaotic?!) weeks leading up to the wedding, the most important thing is having some quality time together to celebrate your ‘Just Married’ state. Consider booking a cosy cottage in the countryside or a weekend away at a spa hotel; there are loads more brilliant UK destination ideas here. You’ll still have a fantastic time and you’ll feel much more relaxed. But you don’t have to ditch your dreams – plan in a romantic far-flung getaway together to celebrate your 1st anniversary together instead! When you hire services for your wedding, whether it be a photographer, a DJ, a wedding planner, a caterer or a hair and beauty stylist, suggest displaying some of their advertising materials in exchange for a discount. You could have business cards on the tables next to the place names. This is an effective way for local businesses to raise their brand awareness and gain new customers, so many businesses will be willing to consider your offer. So there you have our top tips on planning the wedding day of your dreams, without blowing your budget! 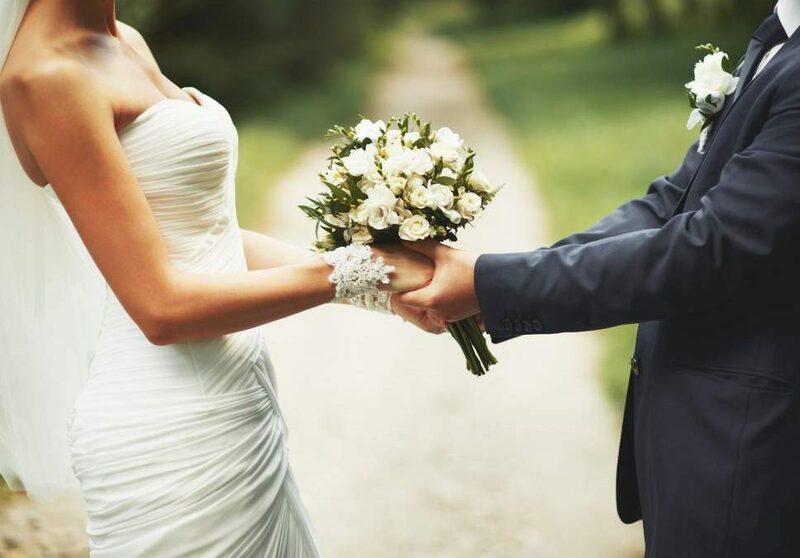 Follow these simple and effective steps for a beautiful wedding day and a happy, stress-free start to married life. You’ll have the perfect day to remember, without falling into debt. Here’s to your big day!